Exciting and intriguing. A good book to curl up with in front of a fire. 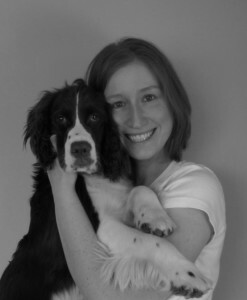 Actually I’d have to say Sarah Fox and Marley are winners. 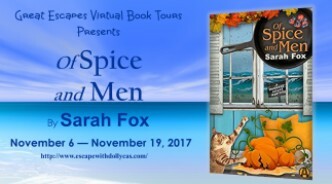 Of Spice and Men is a 5 star read! It is a fun yet suspenseful story–you’ll find humor, mystery, romance, and a look at what happens when a movie crew comes to town. 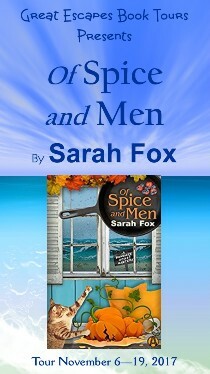 OF SPICE AND MEN is a solid addition to the series providing an intriguing, well thought out mystery. I like Marley as the main character. Not just that she’s both plucky and nosy, but also the way that she has taken on the changes in her life and made a new life for herself in a new place with new (and interesting) people. Sarah created a world that combined movie making, and rumors run amuck all placed in a small town setting where everyone knows that gossip rules the day. It’s always nice when a book has more than just one plot, in this case, the killing is important, but let me say that the mysterious lights in the abandoned house seems a very interesting mystery, who doesn’t like ghosts? This is such a fabulous series with fun quirky character. It was a fun twist to bring a movie set to the small town. It added a nice flare to the story. Grab a stack of your favorite waffles or crepes (there are some recipes conveniently included in the back pages), a steaming mug of hot cocoa or coffee, and settle in for a great mystery read full of things that go bump in the night. For the mystery of this book, it is again well written and full of twists and turns that I didn’t see coming. It was amazing! I loved the characters and the mystery had me grabbed from the beginning. 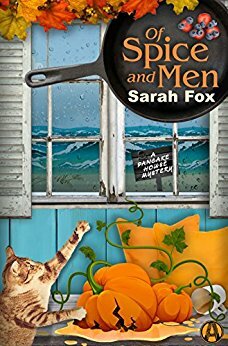 I really enjoyed this book, it’s funny, entertaining, with lots of great characters, a great plot with twists and turns, and some yummy recipes at the end!